Premice: SpaceX has put out a bid for a rover recharging station, to be carried away from the initial landing site, set up by rover, and then left on it's own until a (Model X chassis based) rover comes by, either needing a supercharge, or needing additional power to keep the heaters running during a dust storm. Designs will be graded based on practicality, Additional science capability, and alignment with spaceX's future mars ambitions. (read- someday people will be on mars, how will this be useful to them. Mass limit is 5 tons if carried as cargo, more if it functions as a trailer for a rover. What would you design for this bid? My own approach would be for a "roll-on" charge platform, with clearly placed passive guides for autonomus rovers to reach the charge point. Solar arrays would roll out from two opposite sides, battery pack would be under the ramp. The charging stand would double as a basic weather station and radio relay, have a StarlinkMars antenna, and if mass permits, be able to ISRU oxygen to at least refill personal tanks, of not entire rover tanks. Behind a closed panel is a manual screen and keyboard (oversized keys for spacesuits) for troubleshooting the OS in person or sending emergency messages. Additionally use an inductive charging so connectors are not used. Plus the inductor can also carry a signal if needed in case of WiFi failure. I'd also include an airtight room containing emergency first aid and suit repair kits, spare suit batteries and maybe gloves and a helmet. It would be large enough for a person to strip off a spacesuit if required to conduct emergency repairs to body and / or suit. Also water and O2. Would it be better as an inflatable emergency shelter, ("Pop tents" from the Martian) rather than a separate "airtight room?" I'm imagining that it isnt intended for reular use, only emergency use, so it's probably something that should be low maintinace under sandstorm conditions until it's actually needed. Also, why spare suit batteries, when you can recharge the batteries they already have? Emergency use only. The way I see it, a pop tent needs to be deployed before a person enters thru, I assume a lock of some sort. This takes time. With a fixed room you would enter, shut the door, pull a lever and have a breathable atmo in a matter of seconds. Batteries for a quick change in event of an unexpected power drain or a battery failure. Swap n go ! The basic trade off here is the quantity of solar panels v the quantity of batteries. More panels means faster recharge time more batteries means greater recharge capacity. If intended only for occasional use, I would include an excess of batteries over panels. The vehicle needing changing would approach the charging station and position itself over a flat piece of ground and plug into the charging station. If the need was just for additional power the vehicle could draw what it wanted from the stations batteries. Alternatively the vehicles battery pack could be lowered to the ground, the vehicle driven a short distance forward over a fresh battery pack and the new pack could then be raised up into the bottom of the vehicle. The vehicle would then unplug and continue on its way. The next vehicle would approach from the opposite direction and do the same thing. A small trailer would be provided capable of having multiple batteries packs loaded into it in a similar fashion so that power packs could be distributed to a remote site (eg broken down vehicle now repaired but low on power). A further trailer would be provided to carry the panels from which the panels could be loaded or unloaded automatically using some sort of unfolding mechanism. So the whole charging station could be moved wherever it was needed and when it is no longer needed it could simply be used as an additional power source for a base. The first words spoken on Mars: "Humans have been wondering if there was any life on the planet Mars for many decades … well ... there is now!" An interesting perspective. Given that one of the objectives is to keep a rover alive (electronics not frozen) in a multi-month 90% dust storm, that would seem to suggest a minimum solar panel quantity. At the same time, if irregularly used, you are going to be sitting at full batteries quite often, and would want to have it be doing something useful with the excess solar power in good weather. In other threads I suggest atmospheric water collection + an ice cube machine, dumping ice into a pile in the shade of the solar panels, as a method to turn transient solar power into useful resources- lossy due to sublimation, but no hard cap on storage like something tank-limited. Yes it’s a complex issue with many variables. How much light is received during a dust storm? How long do they last on average? How much power is needed to stop freezing? How much weight for batteries, panels and auxiliary equipment like trailers and ice cube machines? I did wonder if a solar sat would be useful. Could double the power available and minimise the effects of dust storms if a suitable frequency for power transmission was used. But there would be a fairly high overhead from all of the additional equipment so I thought it wasn't practical for a 5 ton station. Saw this elsewhere, thought I'd raise it for discussion. I’d like to see some small 5g cell towers deployed with those distributed charging stations and some drones for advanced reconnaissance. Once you have a few small charging stations distributed around the base station, drones could cover hundreds of miles and find promising locations for rovers to follow up on. I’m guessing Elon will deploy a small starlink satellite system for ground support and relay back to earth. 5g chips will be smaller than starlink and needed for device connectivity and starlink would be for base station and larger rovers. I would have thought a Martian version of geostationary orbit would be preferable initialy - one sat always visable for hundreds if not thousands of km. That may still be a Starlink bus sitting at martian geosynch (which will be significantly closer- 62% closer? than earth geosynch) but I probably should have cropped the quote better. I was raising the idea of an "aviary" version of the waystation, where a drone could safely land and charge, and relay data through to the main network. One of the engineers who designed the Dragon solar panels is now designing origami furniture. In this Reddit thread he also mentions the ITS fans, although can't spill any new info. Since the same team is still at SpaceX, maybe we'll end up with some very space efficient pop up structures for panels and charge stations. While SpaceX is pragmatic enough to use OTS systems instead of bespoke ones, they aren't obsessive about it. The cost of modifying a Tesla chassis to work on Mars (cold, near vacuum, etc) almost certainly outweighs any savings from not designing a more suitable general-purpose rover chassis. I find it odd that they deploy it that way, dragging the whole length over the ground. (Same again when you wind it back up.) A small change would eliminate that, just have the solar array deploy out the back of the trailer instead of the side. That allows you to anchor the end down and then drive the trailer away, letting the array unroll but not dragging it over the ground. Surely that would reduce damage to the panel over time? I think way-stations would evolve as the activity on Mars changes. Starting out as merely a recharge station for autonomous rovers, with a weather and comms system to use any spare power. Indeed, the first "way-station" would be the rover hub at the main landing site itself. The second would be at the site of the first settlement, a modest distance from the landing site since you don't want them too close, which means rovers have to be able to charge at either end. As activity increases, especially as humans arrive, you add some features for larger rovers. For example, the battery packs used in the way-stations should be the same as the packs in the larger rovers, so you can swap them out. Not necessarily easily or automatically at this early stage, but just so the options for maintenance are increased. Likewise, basic electronics like the comms system would be the same in the rovers and the way-stations. You want to avoid "square peg into a round hole" situations when lives might depend on it. • An atmospheric water collector, powered whenever the batteries are full, using power that would otherwise be wasted. • An emergency oxygen tank, in a form that is compatible with suits/vehicles, with the splitter and compressor powered when the batteries and the water tanks are full. • A nitrogen tank, with extractors and compressors (Mars doesn't have much nitrogen in its atmosphere, but it's there), enough to repressurise your rover once you've repaired the leak. • Add a larger chamber to that, with more facilities and a longer duration ECLSS, which is kept pressurised when not in use, the more basic chamber is then used as an airlock for the larger. Which way-station gets what add-on also depends on changing activity. For exploration and science by unmanned small rovers, you have the basic solar+battery stations scattered widely. For a main route between two sites (main base and outlying mines) dozens to hundreds of kilometres apart, you have regular stations that build up capacity as the traffic does. For humans travelling those regular routes, you have a handful of larger stations for regular overnight stops; but many more emergency shelters between. (Essentially a suited astronaut should never be more than a few kilometres from a radio, a walkable distance with a mild injury. And no more than a 12hrs walk or 2hr drive from shelter.) Large unmanned cargo-freighters between separated sites would use the smaller way-stations as nav. beacons and comms relays. So the smallest stations along any fixed route would be line-of-sight. With larger stations for the main recharge stops (larger battery banks). A standard practice might be to recycle older parts into "new" small way-stations at the limits of the existing network. A lot of systems get replaced when they are still functional, but have lost efficiency and aren't worth repairing again. For example, when replacing older battery packs and panels at your main settlements (or upgrading heavily trafficked way-stations), they might be thrown together to add "new" small way-stations out at the edges of low priority areas. Old rovers get re-purposed as way-station rovers. Older pumps and compressors are added to smaller way-stations. When you replace a regularly used pressurisable chamber, you use the old one as an emergency shelter (mostly unused), etc, "upgrading" stations to their next level. Likewise, every time a science station gets added somewhere, for whatever purpose, you ensure it uses standard parts for the core so that it effectively becomes a new entry-level way-station. I don't think roll-out PV panels would last through the first dust storm. Instead, something elevated with a way to flip and dump the dust off. I have seen pictures of things that look like a carport. The one in this picture looks to have about 3 KW of PV on the roof (less on Mars). Clearly there have to be batteries. Tesla's Earth-tech uses Lithium-Manganese-Cobalt Ion batteries which have all the overheating problems we are aware of. They have stringent environmental requirements, use rare and nasty chemicals, and employ active liquid cooling. For unatteneded operation on Mars you want something very reliable with no moving parts, so I would use Lithium-Ferro-Phosphate chemistry instead. I don't think roll-out PV panels would last through the first dust storm. Instead, something elevated with a way to flip and dump the dust off. Just how thick do you think the dust is? [...] You want to avoid "square peg into a round hole" situations when lives might depend on it. You mean "square CO2 absorber in a round ECLSS hole." Sorry, carry on. I think Paul451 is onto the right approach here. You start with the MVP which would be Panels, Batts, and the Electronics package. Perhaps something ISRU-like if you could do that cheap mass-wise. Or perhaps feeding power back to the main ship if you can make the units small enough and site them close enough or "losslessly-enough". The important part would be to modularize you package and interface. Subseqent packages could be fanned out or daisy chained to establish additional capability. I don't think that a solar powered waystation is very useful. Given likely battery performance, a long duration rover probably will be able to cover 500+ km, pulling a trailer with extra batteries then that range can probably be doubled. Long traverses will probably have two or more rovers in convoy. There is an awful lot of territory within 500 km of a settlement, spend just one day exploring each km square and it would take 2000 years! Place SUB-settlements within 500 km and there is no need for waystations. a) Odometer distance isn't linear distance. Driving on unimproved terrain is twisty and wasteful. Even on nice smooth highways, there's a big difference between road distance and "as the crow flies". c) If you want to explore areas away from the landing site, whether science or exploration or mineral assays, you need to do things other than drive in a straight line, you need to spend time around the target area. If you have to drive all the way out every morning and back every afternoon (before you lose light), that costs you a lot of time and severely limits the places you can work (and adds a lot of wear-miles to the vehicles, and the crew.) You want to have handy hubs out at critical sites so you can overnight the vehicles, but also not have to drag around the entire solar-battery infrastructure on the vehicle itself during the day. Given that this frontier is being pushed by Elon "More intersting future for the human race" Musk, I suspect an executive decision would be made to expand operations. It looks like we've got a rough archetecture, I'd love to see if we could get numbers on it. Opportunity died when a sandstorm had a "tau" of greater than 8.0 (which I assume, from this page, means 80% blockage of solar power) and it could not keep it's electronics in operating range. That's a potential problem for an unattended power station, but as the solution is to just have more solar panels, I'd say that we just design in a baseline "survivable tau" of 9.0 or 9.5, preferably with a rover in minimum power mode also draining from the same panels. I can see more uses for putting a portable powersupply at a site of interest away from the main base, so you don't have to trundle back 100km to the main base for a charge. You can live in your rovers for a couple of weeks so long as you have power. Sites of interest could be future settlement or mine locations, and scientific sites to just learn more about the planet. This would be similar to a way-station, but you might place more value on the ability to pack it all up and move on. Leaving it behind could also have uses. It could at least provide redundancy for further expeditions in the same direction. The cheaper and thinner our solar panels get, the more attractive it could become to just leave them at old sites rather than try to recover them. I dream of a fleet of 8 or 10 rovers doing a full tour around the planet. One driver in the front rover the others following on autopilot. They need a few mobile waystations. Drive by night, do research and recharging by day. It needs solar panels that can quickly be rolled out and restored. 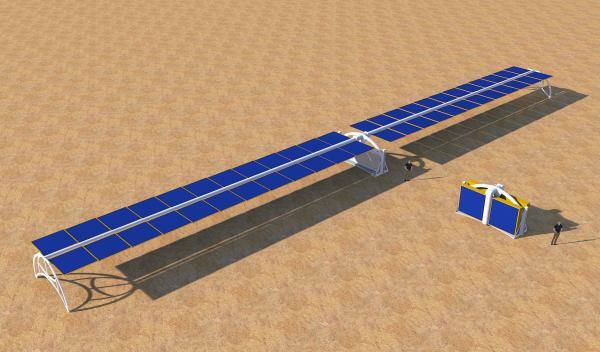 With robotic control perhaps you could have 4 rovers each with a gyrostabilised robotic arm, holding the corners of a really massive solar panel. Smaller rovers could do exploring. There are no roads or trees etc, and not much wind. There are probably vast areas where a football-field sized formation could trundle along without obstruction.. and when there is obstruction, perhaps the two pairs of rovers could bunch up, rolling up the panel till they are merely a long thin train of solar panel. The idea might be easier to imagine with just two rovers, which could still also give you an impressive sized solar panel while driving. Also it is easier to imagine this ribbon tilting to follow the sun. IMO Because anything other than very short distance travel will require a pressurised cab or mini HAB, missions will benefit by increasing the size and independence of such cabHABs there will be less pressure to design missions for hours of driving each way to return each night. The engineers/researchers take their home (and lab) with them. This will mean more larger habitable HABs where it is adequately comfortable to spend at least several days, with the benefit of less wear and tear, more time on location, less charging and use of energy, and less pressure for higher rate charging, and waystations etc. missions will benefit by increasing the size and independence of such cabHABs there will be less pressure to design missions for hours of driving each way to return each night. [...] less charging and use of energy, and less pressure for higher rate charging, and waystations etc. Looking at space-stations and capsules, in cis-Earth space (higher insolation), life support and basic scientific equipment is pretty power-hungry. More than can be charged by simply covering the top of the pressurised volume. With half the energy available during the day, none overnight, you are going to need a decent area of coverage. You could park during most of the day to roll out large panels, but you want to be mobile, doing Science! (Or assaying minerals for mining, or drilling for aquifers, or whatever.) Judging by the MER rovers, the optimal spot for charging isn't the optimal site for work. 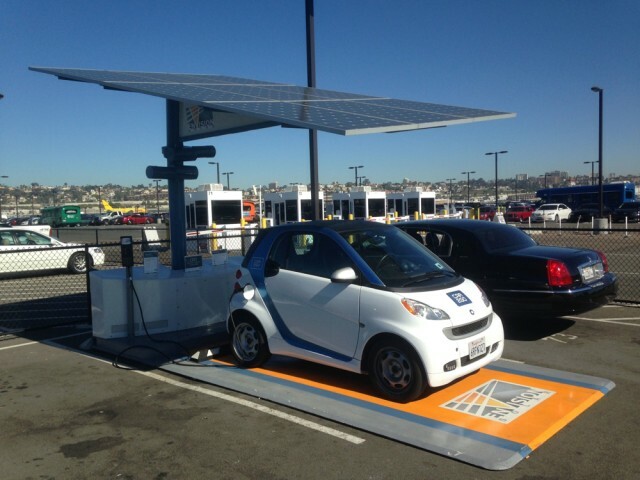 That lends itself to stand-alone charging stations which have lots of solar panels and extra batteries. And if you are returning to that site again, it seems pointless to have to roll up and pack away that charging station and drag the whole thing to the main base/settlement each time. 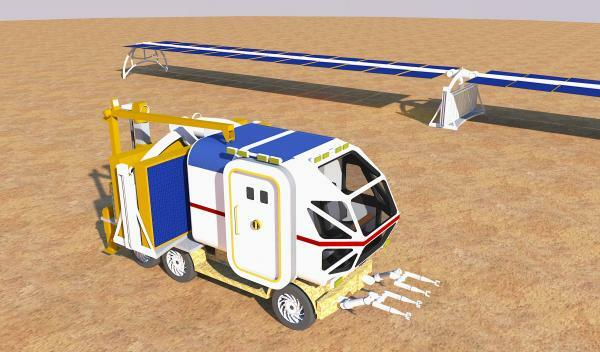 Similarly, you don't want to have to shut everything down between crew visits, instead you can run power cables from the deployed solar station to monitoring equipment, have a central charging station for small robotic vehicles. And that central hub lends itself to a larger satellite dish, giving higher bandwidth back to base (both for equipment-data and especially for teleop'ing rovers). That adds another feature to a standard way-station. In addition to any satellite comms system, you want an antenna mast to increase line-of-sight relay across the local area. Which suggests way-stations would also be put on local high-spots to maximise (radio) visibility. A trailer waystation, that is taken out and installed close to a worksite for the duration would make sense. Each night you return to it and plug in. All the benefits of power, with solar arrays deployed for days or weeks, better comms, emergency O2 etc. And it would fit right in with living onsite for several days or more without long drives "home" every day. On a longer trip it could be hauled along even if the solar panels are only deployed every few days... depending on batteries. Once a route is regularly used then I agree waystations could be left deployed. a bit like "bothes", hikers huts in Scotland! I don't think that typical range numbers for Tesla vehicles on Earth, on dry pavement at 1 G going 60 mph, are immediately useful on Mars, in sand and avoiding rocks, at 0.3 G going maybe 15 mph. Here is my take on the solar way station. It's basically the same design as the solar arrays used for the colony, but with a large battery pack. 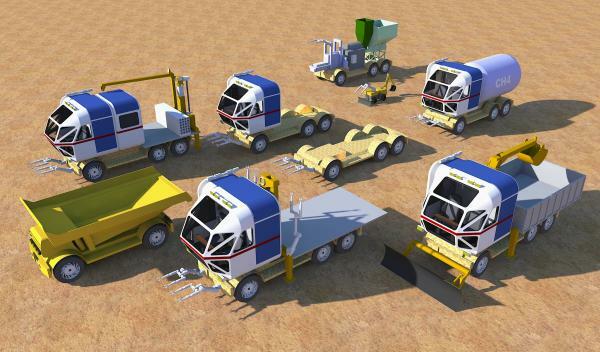 It can be used to recharge vehicle moving over a semi prepared or prepared road between colonies, or as a base camp for a few weeks/months of of base exploration at an interesting site. The drill rig is used to characterize layers in depth for promising mining sites.